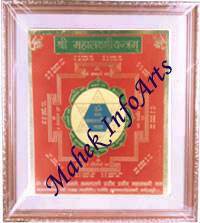 Kritya Nashak Vastu Yantra	to remove Vaastu ill-effects from place of work/residence. Residential houses are constructed according to the requirements of the individual & his financial capacity. If Vastu Sastra is applied seriously plenty of energy is generated by Directional lords which may ensure all types of benefic results. In case Vastu Sastra is not applied, it is possible that malefic directional force may generate & harm the owner. Maximum directional force is generated in North, East & North-East; which can be ascertained at the time of designing the house/building and applied for deriving maximum happiness & comforts for the owner & his family. Sometimes the native may have an excellent horoscope indicating Mahapurush yogas & Raja yogas, still he suffers in life because the house, in which he is living is most malefic and not constructed according to Vastu. As such all such benefic yogas in the horoscope become powerless & without any benefic directional energy. Similarly you will find that some persons without any benefic yogas in their horoscopes are living in good house and are having very comfortable, happy and luxurious life, because they applied Vastu, while constructing their house. Similarly you will find that large number of factories, workshops & mills, are closed down, or suffering losses due to labour problems or machine failures or natural calamities. Why this happens to some buildings because of non-application of Vastu. The construction or entry in the house may be in the most malefic Astrological time. All such structures can be modified according to some simple norms & revive benefic directional strength in such structures. 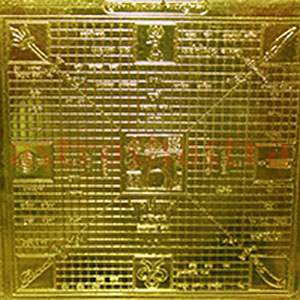 This yantra is a very useful and beneficial Yantra in order to balance energetic and karmic plane. 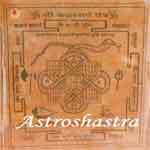 Kritya Nashak Vastu yantra is the most effective remedy for vastu correction without costly alterations or demolition.